1942 Slept late went Down Town groc & mail got candy from my Boy. Dad started his evening tour today. 1943 Today is vanentines Day & we forgot it. Till too late Boy are sleeping today Bud has a boil on Arm & Leg. 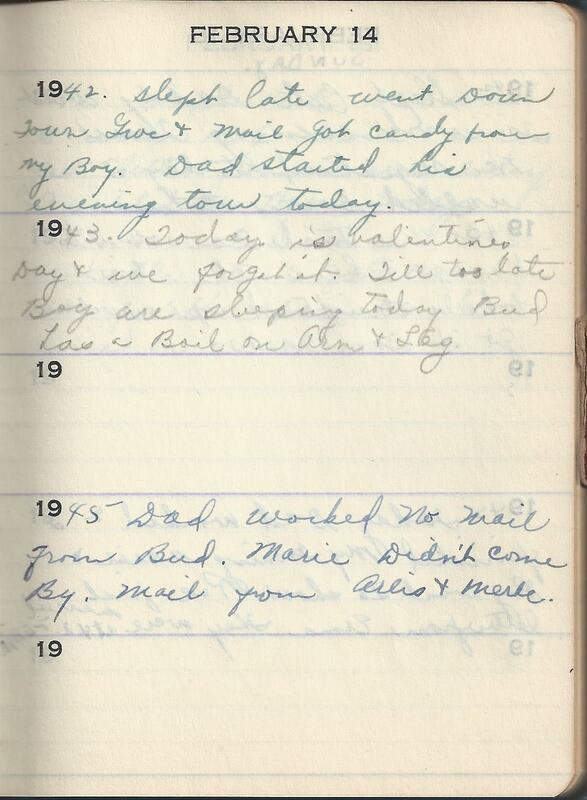 1945 Dad worked No mail from Bud. Marie Didn’t come By. Mail from Arlis and Merle. The 1942 entry about getting candy from Bud was sweet. She continued getting candy on Valentines day from Bud her entire life. When she passed we found many empty valentines candy boxes in her closet. She must have saved them because they were so pretty.